Electronic Frontier Finland - Effi ry has given the Finnish 2011 Big Brother Awards at the Finlandia Hall on Sunday, 11th September. * Public sector category: Ministry of Internal affairs. Advocating a central fingerprint register of all citizens was only a warm-up exercise. A new law drafted in the ministry gave the Finnish police authority to break into citizens' computers and disable security mechanisms in order to observe how the computer is used. In the best Big Brother manner, the law was brought to Parliament as a 3000-page tome so late there was no time for expert review. * Business category: Google. When the goal is to record and organize all information in the world, privacy laws occasionally need to be forgotten. Google has shown exceptional creativity recording wireless Internet traffic "by accident". Google's fight against anonymous and pseudonymous communication in social networks satisfies even the most callous control-freak goody two-shoes. * Individual category: Tuija Brax. A wolf in sheep's clothing -- the former Minister of Justice has shown it is possible even for a Green politician to trample human rights. Her achievements include a copyright law that enables cutting off the Internet connection of a person for mere suspicion of infringing immaterial rights, without any involvement of a court of law. On the other hand, it might be just a clever scheme -- why else would the Brax-led electronic voting experiment, which ended in a catastrophe, have halted the whole project in Finland? * Special Life Work Award goes to Jouni Laiho, civil servant in the Ministry of Internal Affairs. He deserves credit for advocating a fundraising law that makes life difficult for honest organizations, especially online. He not only took part in writing the law, but also instructed the police and courts how to apply it in individual cases. Who cares about separation of powers? On top of all this, Laiho has actively taken part in public discussion of the law, denying all problems and using finest bigbrotherly rhetoric about the necessity of control. The Big Brother Awards are based on a concept created by Privacy International. The tradition started in 1998 in London. Awards are given in about a dozen countries annually. In Finland they have been given in 2002, 2003, 2005, 2007, 2008, and 2010. This time the winners were chosen by a jury consisting of Dr. Herkko Hietanen, Dr. Kai Kimppa, Dr. Janne Lindqvist, Dr. Vili Lehdonvirta, and chairman, Dr. Ville Oksanen. They have all been active in Effi. 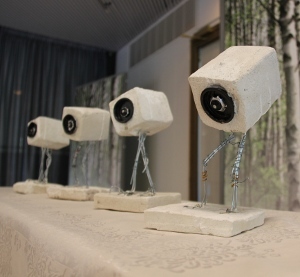 The new prize statues were made for Effi by artist Elina Niiranen. Celebrating Effi's tenth birthday, the jury gave two Winston Smith Awards instead of the usual one, and a new International 19.84 e Prize, to courageous people who have fought against the Orwellian surveillance society. The 2011 Winston Smith Awards were given to two Finnish civil servants, Sami Kiriakos and Tomi Voutilainen. Sami Kiriakos, then working in the Ministry of Justice, wrote a memo of exceptional quality on the use of unprotected wireless networks (WLANs) in which he analyzed the issue in light of fundamental rights. Finnish law at the time stated it was a crime to use an open WLAN without explicit consent from the owner of the WLAN, thus making it almost impossible to offer an open WLAN on purpose and equally impossible to know whether one is permitted to use an open WLAN. Kiriakos' memo led to a new law that explicitly says an open WLAN may be used to access the Internet. Thus Kiriakos implemented one of Effi's goals for the next government already before the election. Tomi Voutilainen is chief auditor in the National Audit Office, which audits the state's finances and asset management. Voutilainen has called for e-mail privacy and criticized various insanities in governance, including "Lex Nokia", the law allowing bigbrotherly surveillance of e-mails of not only employees but also residents of apartment buildings and in any other case where somebody provides electronic communication for another person. The 19.84 e award winner is James Love, director of Knowledge Ecology International. Ville Oksanen explains: "Unfortunately Effi is unable to give a megastipend like the Millennium Prize as we do not have a million euros. Nevertheless we want to thank also people who internationally fight for fundamental rights and against Big Brother society, so we decided to start this 19.84 euros prize. James Love fills these criteria if anyone does. He has organized civil society internationally in questions concerning immaterial rights. He has also developed incentives alternative to patenting for the medical industry, thus helping make drugs more easily available in developing countries." Electronic Frontier Finland - Effi ry was founded to defend fundamental rights on the Internet. The association aims to affect legislation on e.g. freedom of speech, copyright and privacy issues in Finland and Europe. Effi is a charter member of European Digital Rights (www.edri.org). More information on Effi's website www.effi.org/.